Do you struggle with adult acne? Are you in a never ending search for lotion and cream that combats dryness, acne AND age prevention? I was for a very long time. 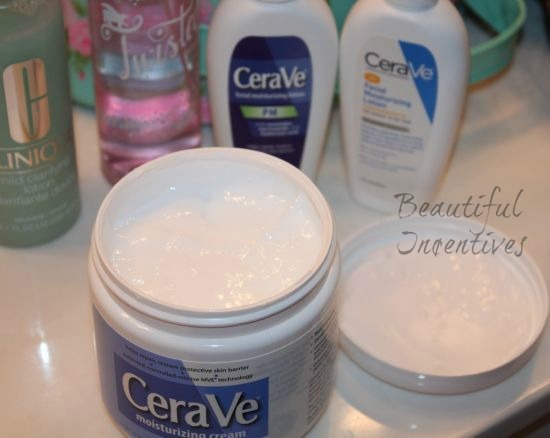 Each product I tried had its perks, but never contained all 3 of those true benefits, until I discovered CeraVe. During a discussion with my dermatologist about combating adult acne and the signs of aging, he suggested that I try CeraVe and here's why. One, I asked for something more budget friendly than what he initially offered ;) Two, CeraVe is very gentle, fragrance free, leaves your skin emollient and has 2 certain ingredients that make it unique to other skin care. One, a chemical called hyaluronic acid , which is stated to penetrate deep into the inner layers of our skin and replace/replenish the lack of lipids that protect our skin barrier. Niacinamide is the other ingredient that helps to prevent redness. CeraVe is a bit pricey for a drug store brand, but well worth the cost now that I have tried it out. I didn't want to risk wasting money so I contacted the lovely CeraVe PR and she happily obliged to a review. I was so excited to try these products, as I have seen nothing but rave reviews across the board. The first product I chose is the Foaming facial cleanser, because it was gentle, light and did the job. It took most of my makeup off, but eye makeup is always a toughy. I don't need fancy things to cleanse my face. That comes in with treatments and special creams. That is what you save your hard earned money for. The second product I chose was the Facial Moisturizing Lotion AM , specially formulated with an SPF of 30. I absolutely love this combination. I get to moisturize my skin not only with the anti aging benefits, but also protect it from further damage from the sun. Finding a combo that works for me is rare and this really works. It goes on smooth, very easy to rub in and does NOT leave a white cast that I can tell, but I am naturally very fair complexioned. Although I have been steering toward more natural sunscreens, this chemical sunscreen concoction isn't terrible. Not ideal, but could be worse. I am still experimenting, but the combination of things in this is nice. This, along with the other lotions and creams has control release ingredients which means that it's not just a short burst of moisture that you will need to reapply. It continuously moisturizes for 24 hours. One thing to note- When I used this for a week I broke out and when I stopped, I didn't. I am not sure if the sunscreen is the culprit, but I know the other products aren't. It may be even though it claims to be non-comedogenic. It is common to break out from chemical sunscreens. We all know moisturizing our skin at night is as essential as it is in the morning. That is where my third choice comes in, the Moisturizing Lotion PM. This has the same unique ingredients I mentioned above. Along with all the other products. I love it. It goes on smooth just like everything else and is not at all sticky. It sinks in like a dream and for a lotion, it REALLY moisturizes almost like a cream base. I was thinking this thin lotion isn't going to do anything, but I was wrong. This is also control released lasting 24 hours. When my skin gets extra dry during the winter months I need something thicker and that is why I chose their Moisturizing cream. It is nice and thick, but not overtly so. It's just right and it is REALLY good at what it does. My skin is so emollient and hydrated with this stuff. It does not clog pores and there is no sticky residue or anything of the kind. It blends in flawlessly and feels so good on my skin. The scent of all these products, sans the AM with sunscreen, is near nonexistent as well for those of you who are sensitive like me. All I detect is that "cream smell" but there is no added fragrance, which is a huge plus. Fragrance products often break me out! Again, this contained control release ingredients so it lasts the whole day. For the most part, I absolutely loved these products. I have used them religiously for over a month and I am sold. I definitely noticed a difference in the dry flakes and texture of my skin. The flakes disappeared. I also did not have to reapply anything at all. I have a weird issue with my face. It is very dry in some spots, yet oily in others and very cystic acne prone. This did not aggravate it at all. In fact, a lot of my acne cleared up day after day. Not the very deep Cystic kind, but the other kind I have. I'd never seen my face so clear and soft with a glow. I also noticed that my makeup went on a lot easier and nicer. I don't know just how 'strong' the anti aging benefits are but I do know it is protecting the skin and I love the way it looks when I use it. They also carry a "Renewing" line for those that battle very dry skin. I hope that I can afford this in the long run, because I am hooked. If you have any of the similar problems that I mentioned, go out and buy some, stat. I went without this for over a week and nothing I used compared to it. It's a keeper, even compared to more expensive OTC brands. I think the chance that you'll love it is very high. Two caveats to note: The pump on the AM lotion came broken. I could not get it to budge open. I tried everything. The other pump on the PM was fine. I hate this, due to the fact that it's much harder to get good product without smearing bacteria all over your hand in the process. Not to mention putting it all back into the bottle. So beware of the pumps. Try them to make sure they open, before you purchase. The other: It is not Paraben free, but there is sufficient lack of evidence to prove that parabens are damaging at the level we use them. I use very little with caution and that's all you can do.